Submitted by witness on Monday, December 3, 2012. OBSERVED: On November 24th, 2012, at 9:00 AM, I was elk hunting on the west facing slope of Mount Baldy, above a closed forest service road called Baldy Face Road. There was a complete trail of these bi-pedal tracks leading around the face of the mountain. I've taken a picture of a track with my boot next to it as a point of reference as to the size of the track. My boot measures exactly one foot, and four and half inches wide, and my average step is about three feet. I am six foot and one inches and had to leap to reach each track. I'm guessing it had a rough estimate of a five foot step, which were heading north, north east up the mountain. I know it wasn't a snowshoe because snow shoes are so long that they overlap themselves, and have a hinged claw in the middle for traction which these tracks showed no sign of. Each step was long and clean, bearing no signs of drag. I guessed the tracks to be about 4-5 days old. I side hilled the mountain heading south, then down to the road back north, only to see my tracks being the only ones up off the road since it snowed. I've never crossed another person's tracks up there before, since its a pretty secluded area that has hidden lakes for the willing hiker. But never a track like this one ever. A hoaxer wouldn't place them so far away from where people go as they would never be discovered. This place is literally the middle of nowhere . ENVIRONMENT: forest, mountain ridges and pretty rough country and deadfall. The gentleman hunts Elk in a very remote area of the Big Belt Mountains. He has hunted there many times before and has never come across another human, most likely due to the rugged country. He contends that you either have to haul everything in yourself or on horseback. The closest road is a dirt one about 15 miles away. The prints appeared to be a few days old, and although snow melt may make the prints larger than they were originally, they are still very large prints. 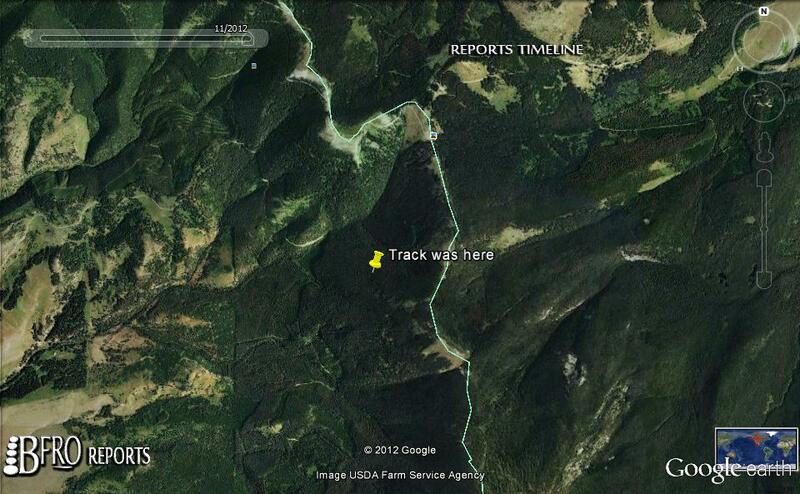 Not really a believer in the existence of bigfoot, he took only one photo as he tried to figure out what made the track. Each footprint appeared to be about 5 feet apart and he had to leap to the next one as his stride wasn’t even close. It was the last day of Elk hunting and he was mindset on getting one, and continued to hunt without taking more pictures. As the day progressed he thought more of what he had seen. 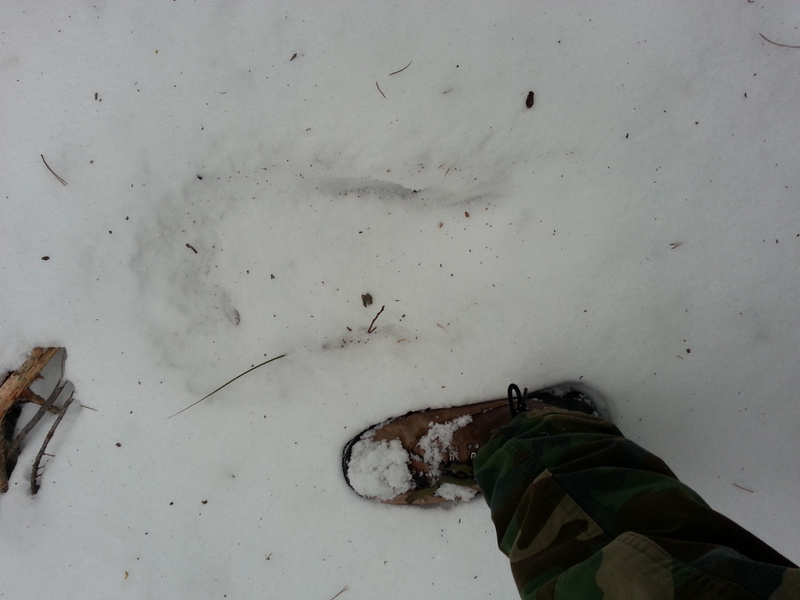 Having worked with the Department of Fish and Wildlife he was familiar with bear tracks and knew it was not that, nor snow shoes. And figuring the remoteness, it was unlikely it was another hunter. Also, whoever had made the track would have had to have been a terrific athlete to leap 5 feet, one leg at a time, uphill at an angle at an altitude of 7500 feet. He then realized that it could possibly be a sasquatch. He now believes there is such a creature, as he has no other explanation of the track ways. He regrets not taking time to take more photos or measurements and plans to return to the area to look for more evidence. The photo he took, and the description of the track does indeed seem to have all the characteristics of a sasquatch print. Even considering print disintegration with snow melt, I feel this is the track of a very large sasquatch.